Ok, i'll admit something here. This is kind of like Chicken Pot Pie. I can admit it. Seriously, though... my mom used to make a dish she called "Meat Pie A La Lu" & i loved it. Several months ago, she emailed me a "Chicken Pie A La Lu" recipe, saying it was the same as the meat kind, but that she used chicken because that is what she had on hand. She said it was delish. So i decided to give it a try! Well, i made it & when it was ready, i asked Brad if he wanted me to bring him some. He said sure. I brought him some & he was like "oh! this is just like chicken pot pie!". He said it like that was a GREAT thing, because he LOVES Chicken Pot Pie, but i was like "aw man. you're so right. i thought i was trying something new!" HA! I didn't actually look at my Chicken Pot Pie recipe, but this one can't be too far off. 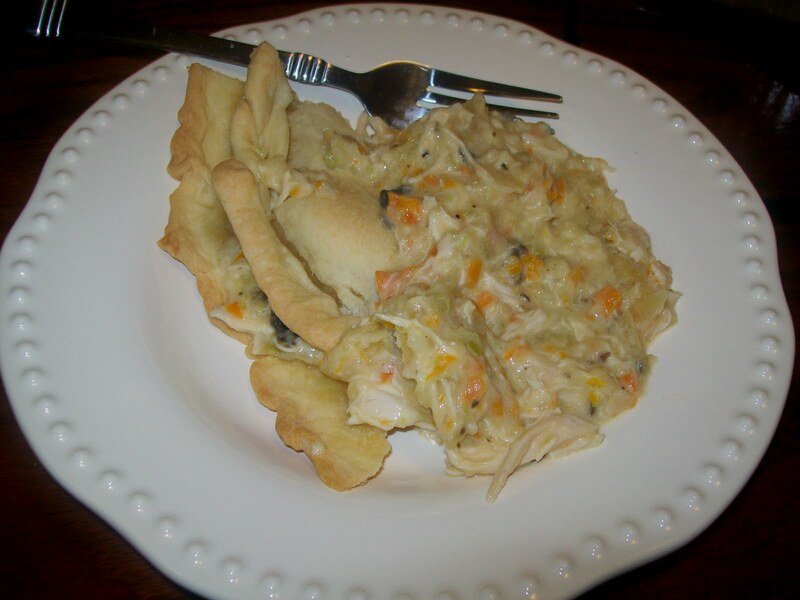 Except i usually put biscuits on my Chicken Pot Pie & this was with pie crust. & i don't remember if there is cheese in pot pie. And i know there are peas in it, lots of times (& not in this). Anyway. It's similar, okay? But good. Saute lightly garlic, onion, carrots & celery. Add cut up cooked chicken. Add soup, cheese, seasonings & milk. Like deep-dish pie plate or casserole dish with pie crust. 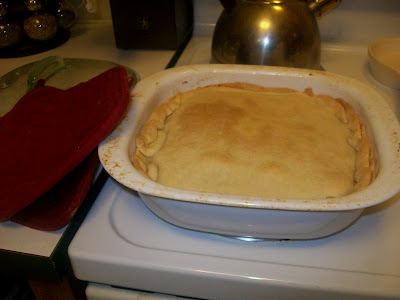 Fill with mixture & top with pie crust. Bake at 350 for 30 minutes. It was SUPER easy to make & turned out yummy! For the dish, you might try the Magic Eraser from Mr. Clean or some BarKeep's Friend. Recipe looks delish! I'm trying this after I get married and have to cook LOL. This looks soooo yum. Thanks! I'll definitely make this one!